Baisakhi 2013 in Birmingham from Jas Sansi – Creative Commons license. Both Hinduism and Sikhism originated in India. 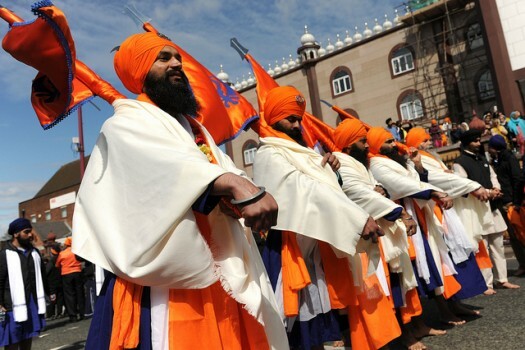 South Asia has the largest population of Hindus in the world (63.65%) and is home to over 21 million Sikhs. This page explains more about Hindu and Sikh festivals. Hindus base their calendar on the moon. Most festivals happen in the middle of the month when the moon is full or when the new moon is just about to appear. Some are only celebrated in certain regions of India, others all over the country. Some involve fasting and private worship in the home, others are celebrated publicly with the whole community taking part. Some are celebrated everywhere but the stories told about their origin vary from area to area. So do not be surprised if Hindu friends from different backgrounds tell you different things about a festival and not all the festivals described here will happen in your area. Hindus in Britain do not feel able to observe festivals in the way they did in India. For example, in India, Diwali lasts for five days and these are public holidays for schools and colleges. Even office workers have two days off. But in Britain public holidays do not coincide with Diwali so Hindus have to limit their celebrations. Other festivals are celebrated on the nearest weekend to the actual dates on which they occur in India. Hindus also feel unable to celebrate as fully as in India where most festivals take place outdoors. This information about Hindu festivals is taken from Chapter 6 of Chapatis For Tea by Ram Gidoomal & Margaret Wardell. This festival takes place in September or October. Navaratri means nine nights and this is how long the festival lasts. It is celebrated by Hindus from the state of Gujarat (Goojarat) in India. They worship the goddess Parvati, the wife of Shiva. In the home they place a small brass image of her on a bed of rice in a copper dish and perform puja before it twice a day. They also keep a lamp burning; and each day they hang a garland of seasonal flowers from a peg above the image. Members of the family offer special food to the goddess at various times. In Britain if the women of the household go out to work it is often not possible to make a fresh garland of flowers each day nor keep the lamp burning continuously. In Britain during Navaratri some Hindu families get together each night in a local hall to enjoy singing devotional songs in praise of the goddess and dancing stick dances, known as raas garba. These are folk dances in which people knock short sticks together to keep time. They dance round a special shrine to Parvati. This is a six-sided box with a cone-shaped top. On the top is a lamp, and on each side of the box there is a picture of a different goddess. The whole thing is decorated with coloured lights and tinsel. During the evening a a priest performs the arati ceremony. Lots of brass maps are placed around the shrine and people make offerings of fruit and sweets. These are later given out as prasad. In large cities in Britain the dances are often organised by a small group of people who hire a hall and musicians and then sell tickets for the event, known as a garba night. In Bengal, on the eighth day of Navaratri, Parvati is worshipped under one of her other names, Durga. A large clay image of her, with eight arms holding different weapons and riding a tiger, is installed on a raised platform. In the story of Rama he prayed to Durga when his wife was captured. Hindus remember this at Navaratri, offer puja to the image and dance round the platform. At the end of the festival the image is taken in procession through the town and thrown into a river. Devotees believe it takes all their bad luck with it. Durga is also the symbol of mothers. Girls who have been married in the past year try to return home to visit their mothers for this festival if they can. This festival is sometimes included as part of Navaratri because it occurs on the day after. It celebrates events from two great Hindu poems, the Mahabharata and the Ramayana. In North India people celebrate Rama’s defeat of Ravana, king of Lanka. Rama was the eldest son of the king of Ayodhya. Rama entered an archery contest in a neighbouring kingdom. As a reward for winning it he was given the hand of Sita in marriage. The king of Ayodhya had three queens. When Rama returned home, the youngest demanded that her son be made the heir to the throne and Rama be banished from the kingdom for 14 years. This queen had once helped the king to win a battle and he had made her certain promises which she now demanded he fulfil. So Rama had to go and live in the forest with Sita and his brother Lakshman. One day Rama and Lakshman were away from their dwelling place trying to catch a spotted deer to which Sita had taken a fancy. While they were doing so Ravana, the evil king of the island of Lanka, kidnapped her. Rama and Lakshman searched for her for many days. in their wanderings they came to a southern kingdom whose ruler, Sugriva, had been deposed by his brother. Rama promised to help him regain his throne and in return Sugriva sent his monkey general, Hanuman, to look for Sita. Hanuman finally discovered her being held a prisoner on Lanka. His monkey soldiers formed a bridge from the mainland to the island and Rama, Sugriva and their army crossed over to Lanka. In the battle that followed Rama killed Ravana and rescued Sita. Rama, Sita and Lakshman then returned to their father’s kingdom. There were great celebrations and Rama was crowned king. Dusserah celebrates the defeat of Ravana. Large figures of him and his helpers, made from bamboo and paper, are blown up with the fireworks. This is the most important Hindu festival and is celebrated all over India at the end of October or the beginning of November. For many Hindus it includes the New Year. In most places it lasts for five days but in some only three. Diwali means ‘row of lights’, so in the UK Hindus decorate the fronts of their houses with candles or a string of electric lights. They usually hire a hall for the festivities, which include fireworks for the children and a lavish meal for everyone. They also dance and sing to show their joy. Many Hindu clubs and temples arrange this dinner on the Saturday evening nearest to the actual days of Diwali. Like many other festivals Diwali celebrates several stories. One of the most popular tells the story of how Rama rescued Sita and brought her home to Ayodhya, where he was crowned king. Other stories tell how the god Vishnu won a battle with the wicked giant, Narakasura, and how he tricked a king named Bali who was trying to take over the world. People in different parts of India think some of the stories more important than others, so the festival is not celebrated in the same way everywhere. At Diwali, Hindus also remember Lakshmi, the goddess of wealth. She is supposed to visit houses that are clean and tidy and lit with lamps and brings good luck for the coming year. Lakshmi’s visit is very important to those who own shops or businesses. Money, gold ornaments, cheque books and account books, representing her, are offered as puja. Businessmen make sure all their debts are paid and make up their account books. Hindu businessmen present theirs to Lakshmi in the temple at a ceremony called chopra puja. The next day they start new ones. Diwali is a family festival. People give each other presents and share meals. Sending cards is becoming more popular, especially in Britain. The idea of the festival is to show that just as darkness can be driven away by light, so evil can be driven away by good. Hindus often say, ‘Diwali is the same as your Christmas’, because of the feasting and the exchange of cards and presents. This comparison is misleading. The origins of the two are totally different, though the ways of celebrating them may be superficially similar. Mahashiva-Ratri which means ‘Great Night of Shiva’, takes place in February or March. Shiva is one of the most important gods in Hinduism. He is believed to have the power to create and destroy. Sometimes he is pictured dancing in a circle of flames. One story says that the energy of Shiva’s dance created the world, keeps it in existence and will destroy it one day. Then he will start to dance again and the cycle of creation will begin once more. He will repeat this numerous times. In some stories Shiva is said to perform this dance on Mahashiva-Ratri. It is really neither a festival nor a feast but a fast. The devotees of Shiva go without food for 24 hours and offer worship to his image between midnight and sunrise. They do so by repeating his name and placing flowers and fruit in front of the image. Then they pour water in a steady stream from a container suspended above it. At sunrise the worshipper goes home, bathes and breaks the fast. Holi takes place in the spring, either late February or early March. In India the whole festival lasts 5 days. People light bonfires and fireworks, burn figures of demons, and dance. In Britain they may light a bonfire on an open space near a temple or public hall hired for the occasion. They tell stories about the god Krishna, especially of his youth when he is said to have played many tricks on people. So Hindus place practical jokes on each other at Holi. This festival celebrates the birthday of the god Rama and is especially popular with Hindus from North India. It takes place in April. The celebrations, which include stories from the Ramayana, happen at home but people also go to the temple if they can. As a special part of the worship they sing the Ramanama, a list of all the names of Rama. Rama Navami is a fast day when Hindus do not eat certain foods, including rice and vegetables. Other foods, which most of them could not normally afford, are eaten instead. On the day of the full moon, in the same month, the birth of Hanuaman the monkey god, is also celebrated. This festival is sometimes called brother-sister day. It takes place in August. Raksha means ‘protection’ and Bandhan means ‘to tie’. This festival reminds people of a story about the god Indra. An evil monster attacked him, but his wife saved him by tying a magic string round his wrist. Hindu girls tie red and gold bracelets, made of thread or tinsel, round their brothers’ wrists. This thread is called a raksha or rakhi. By her action the girl shows that she has chosen her brother as her protector. She also uses the occasion to give her blessing to him and assure him of her protection too. In return he usually gives her a present. Friends also exchange threads as a sign of renewed friendship. The following day is a fast day. No one eats till evening when they enjoy a feast to celebrate the birth. Many temples contain an image or picture of the baby Krishna. This is put into a swing or cot decorated with flowers. People take turns to push this to ‘amuse the baby’. They also perform plays and songs about Krishna. The Sikh calendar is based on the phases of the moon, so the dates of festivals vary from year to year. The gurdwaras [Sikh place of worship] publish an almanac giving the dates for the year in question. In India they often happen on a weekday but in the UK this is inconvenient so the festival is usually held on the nearest Sunday to the actual day. A feature of most festivals is the continuous reading of the Guru Granth Sahib, known as akhand path. It takes about 48 hours, starting two days before the festival and being completed before dawn on the actual day. Readers work in spells of no more than two hours each. Members of the Sikh community come to listen when they can. Akhand path is performed on all important occasions in the family and community. In the home Sahaj Path, the broken reading, is more common. Both are reminders that Sikhs are deeply attached to their scriptures which are their guide and comfort in every aspect of their lives. As many people as possible come to the gurdwara early on the morning of the festival day and listen to the reading of the last five pages of the Guru Granth Sahib. Then follow readings, prayers, and hymns about the life of the Guru whose festival is being celebrated. At the end of the service kara prasad is served. In India, and sometimes in Britain, the Guru Granth Sahib is carried through the streets on a decorated lorry. The worshippers follow, led by the five panj pyare. Bands play joyful music. There are usually competitions and sports with prizes. Prominent speakers may come from a long distance. In Britain most festivals are held inside the gurdwara because of the climate! This information about Sikh festivals is taken from Chapter 10 of Lions Princesses Gurus by Ram Gidoomal & Margaret Wardell. This assembly of Sikhs to worship God and listen to the teachings of the Guru was introduced by Guru Amar Das in the 16th century. It usually happens on April 13th, the beginning of the Sikh New Year. After 1699 Baisakhi assumed a new importance because, at the festival in that year, Guru Gobind Singh initiated the Khalsa and baptised its first five members. Each year on this day the old flag on the gurdwara is replaced by a new one. In 1919 the British Government introduced restrictive measures throughout India, to curb the disturbances happening in some places. All meetings were banned. At Baisakhi a large number of country people began to gather in Amritsar. In the heat of midday, many of them went to rest in the Jallianwala Bagh, an open space in the centre of the city. Some political leaders took the opportunity to speak to these people but General Dyer, who was in charge of the army in Amritsar, saw it as a violation of the law against public meetings. He marched his soldiers into the Jallianwala Bagh and, without warning, ordered them to fire into the crowd. There was only one exit to the garden, that through which the soldiers had some. Panic ensued. 379 people were killed and over 2,000 injured. This incident did irreparable damage to Sikh-British relationships and a new nationalist organisation, the Central Sikh League was formed to oppose British rule. The story of the Jallianwala Bagh has been passed down the generations. It is vividly portrayed in Richard Attenborough’s film, ‘Gandhi’ and many Sikhs feel deeply about it. This festival is popular in Britain but in India celebration is usually confined to the Golden Temple in Amritsar. It takes place at the end of October or the beginning of November, depending on the phases or the moon. Diwali celebrates light and deliverance. In Amritsar the Golden Temple is illuminated, a firework display is held and the temple treasures are on show for about two hours. In India the gurdwara is lit with wick lamps but in Britain Sikhs illuminate their houses as well as the gurdwara, using small electric lights or candles. They place them outside, on window sills, above the door and on garden fences. In places where many Sikhs live the streets are lined with hundreds of lights. Diwali is celebrated by Hindus too but the stories associated with it are quite different. Sikhs remember an incident in the life of Guru Hargobind, the 6th Guru. An officer of the Moghul emperor, Jehangir, had imprisoned him in the fort at Gwalior. His official crime was the non-payment of a fine imposed on his father. But the officer also suspected him of treason because he had raised his own army. Guru Hargobind appealed to the Emperor who examined his case personally. He ordered the release of Hargobind. But 52 Hindu princes were sharing the Guru’s imprisonment and he declared that he would only accept his freedom if they were also released. Jehangir replied that as many princes as could pass through a narrow passage holding on to Hargobind’s clothes would be released. The Guru ordered a cloak with long tassel-like ends to be brought. Everyone of the princes walked to freedom holding on to the train. These festivals remind Sikhs of importance events in the lives of the Gurus. The birthday of Guru Nanak is celebrated in November and that of Guru Gobind Singh in December. The martyrdom of the fifth Guru, Arjan, is remembered in May or June. Some gurdwaras offer fruit to passers-by on that day. Sikhs also remember the martyrdom of Guru Tengh Bahadur, the ninth Guru, and the sons of Guru Gobind Singh.